This is very odd indeed. So I was playing with the Pan Pastels, wanting to try out a couple of things. I was experimenting with a sort of ghost print idea, using the acrylic medium and pressing a thick letter stencil to the plate then pulling a print, it to see what sort of effect that gave me over the Pan Pastels. Not anything special. But I had a thought – could not the acrylic medium be used as a sort of fixative for the Pan Pastels? 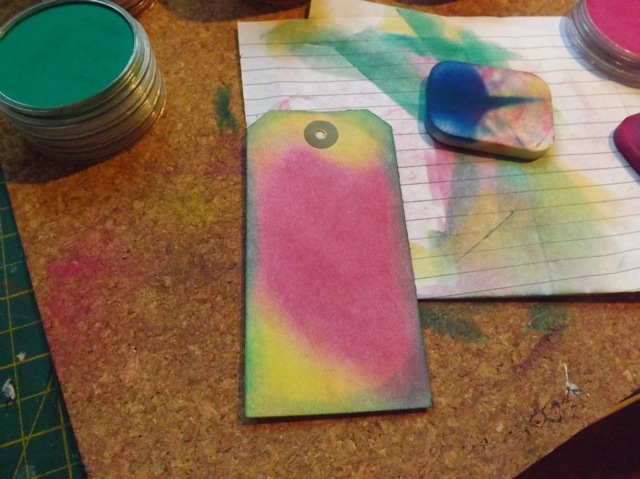 And could the Gelli Plate be used as the application tool? I’ll preface this all by saying that I’m not sure it is a superior method to some sort of spray fixative – unless the whole spray thing is something you avoid – but it is an option. Let me explain. then I pressed the tag onto that. Like with the experiment yesterday, the medium traps the pastels, fixing them. Then I did another stencil layer with a different colour and sealed that. Maybe a bit. Anyway THAT gave me another idea! 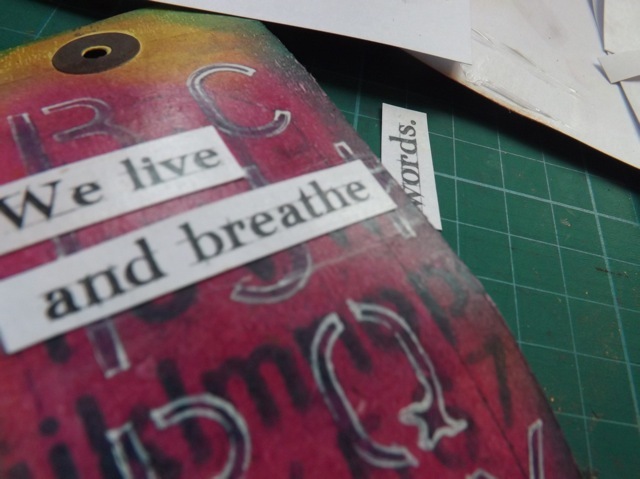 I am frustrated by the fact I often want to add text to things and what I have is an inkjet printer. 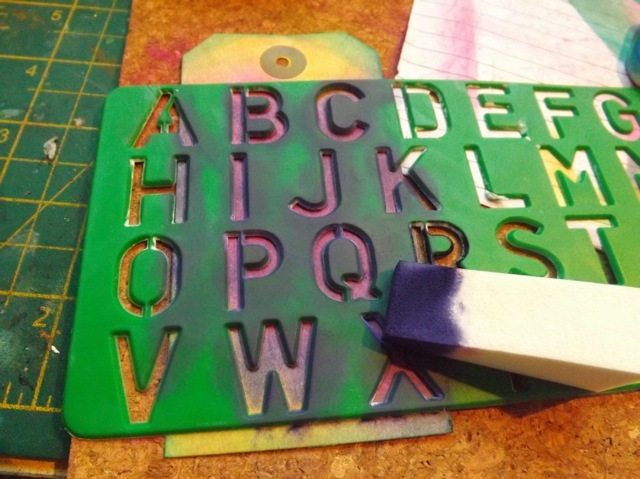 Printed text smears when you apply acrylic medium over it. Yet I would want to seal the text, or maybe choose to use a printed image, for example, then seal it. Rubbish, hummm? 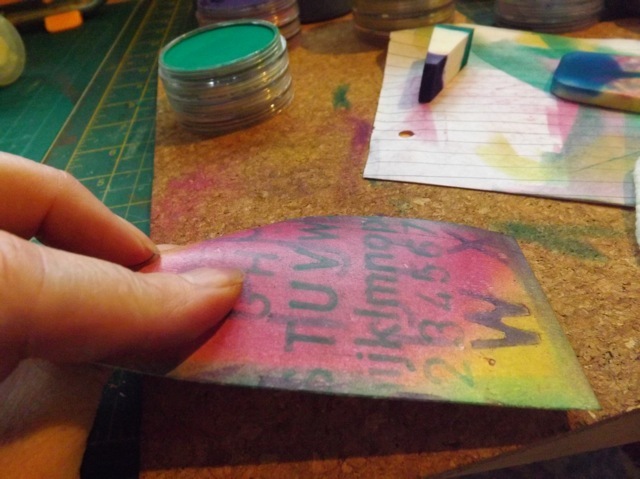 Well I thought that perhaps using the Gelli plate to apply the medium over text would seal it without the smearing…and ya know what? I does! Same process. 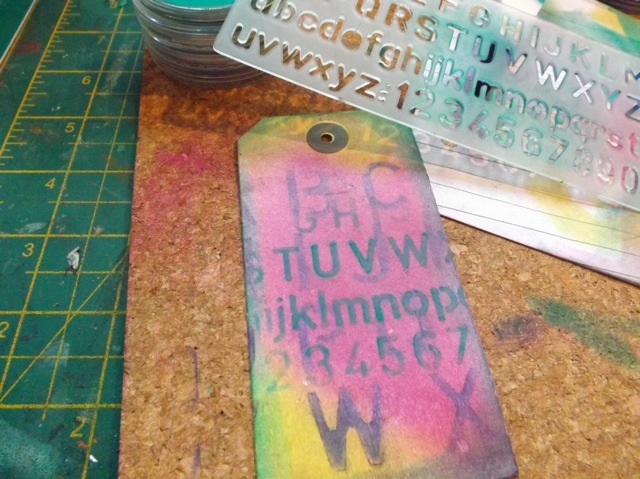 Just print the text, apply the acrylic medium to the Gelli plate, then carefully press the text down on to the plate. when you pull it off, the text is sealed. 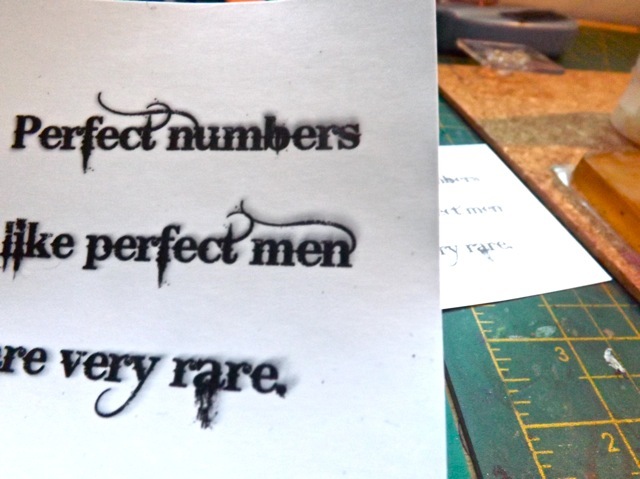 Try not to wiggle it about, which WILL smear the text – although that does give a kinda cool, almost shadowed look to it, that is better than the smeared look if you brush the medium over it. It’s a bit like a halo, but more as if you shaded the text with Copics, I think, than it bled, as the shading is in the SAME position, not uniformly all around the letters. Can you see it is really only at the TOP, and more at the end of the words? Now, I added some of the Signo white pen and it was ages till I brushed over it. I didn’t expect it to smear, but it did. I suspect that as it was the pen over the medium, that might be why. See the smear there under BREATHE? I simply added a bit more medium to the plate, pressed the half of the tag I’d not yet worked on to it, let it dry, then carried on with the last bit f text. And look, Ma, no more smears! You can see the brush strokes, but the paint around the Q is smear free. So the question becomes is it worth it? More worth it than some other sort of fixative? Well, I would say if you hate, or are affected by, spray fixative, or if it is miserable and rainy outside and you can’t get to a “well-ventilated area” or if you just don’t have any fixative handy, using acrylic medium and the Gelli plate to apply a fixative to a SMALL piece is an option. I will def. use it for text from my ink jet printer in the future! A few notes. 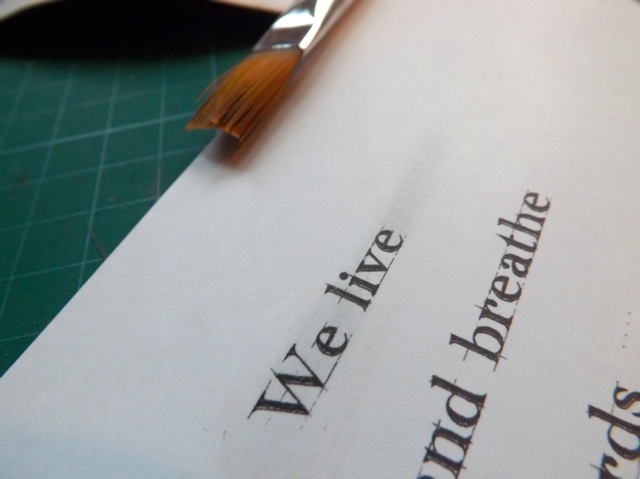 Do make sure your plate is scrupulously clean, and your brayer, and in fact the application tool for the medium, be that brush or tube nozzle. On white card, every little smudge or dot of ANYTHING is going to show. You might like that. I think you could easily add Distress Ink to age the paper first, then print the text over it, then seal it. That would keep the DI from remaining water-reactive, if you needed it to be. And it is completely useless, to my mind, for BIG pieces. I don’t think you would want to seal a large canvas this way. 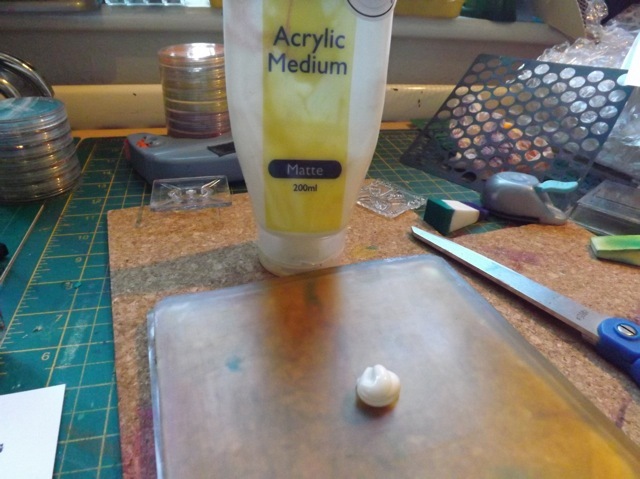 BUT it does let you seal small bits, then layer them on without the fear of the smear, so you should be able to then use acrylic medium over the whole of the piece. 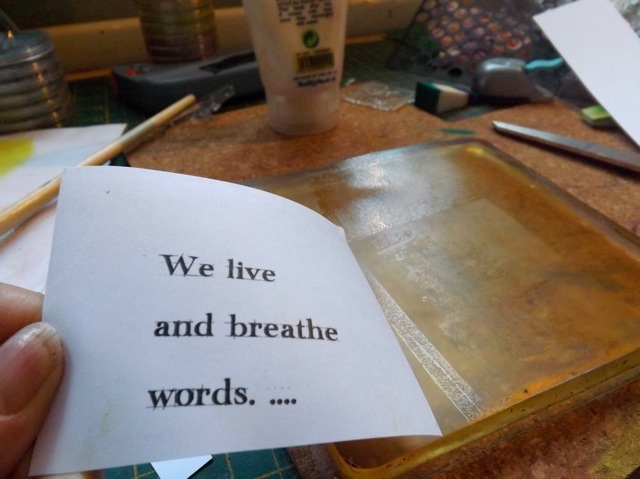 For me, this is a quick and easy solution for no-smear inkjet text, and for THAT, I am doing the happy dance. Categories: art, Gelli plate monoprints, Pan Pastels, tips & finds, Uncategorized | Tags: art techniques, Gelli plate, how-to | Permalink.